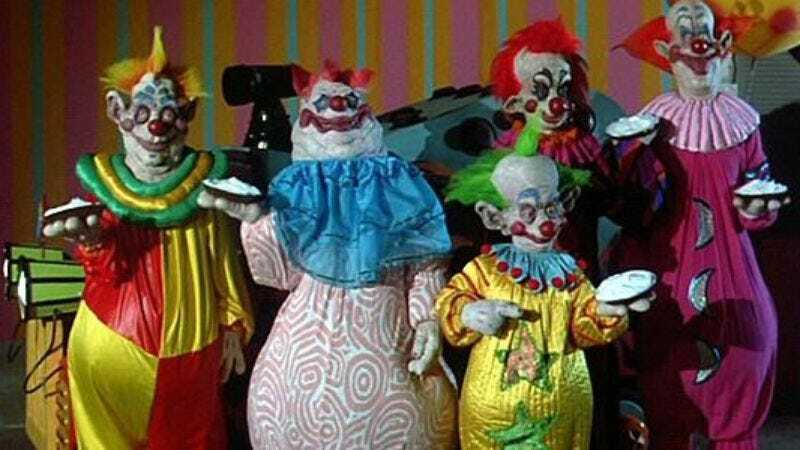 Good news for B-movie fanatics and those with a very specific fetish, as it would appear that 1988’s Killer Klowns From Outer Space is getting a reboot. Stephen Chiodo, director and co-writer of the original film, recently told the Movie Crypt Podcast that he is “currently pursuing a long-arc series for cable.” How much mileage Chiodo and his creative team can get out of a killer clown invasion where the victims were incarcerated in cotton-candy cocoons and offed with popcorn guns remains to be seen. But the success of Ash Vs. Evil Dead is more than likely what got the ball rolling on this project, and that show took a long weekend at a cabin and spread it out over 12 episodes. Chiodo goes on to describe the film as a “requel,” a hybrid remake and sequel. “We’ve been developing this for a while,” Chiodo continues. “It’s a trilogy in four parts, and it really follows the continuing adventures of new people who are experiencing this phenomenon of a Klown invasion.” In this golden age of streaming services, it’s more than likely someone will pick up the series; Starz attracted a new audience base when Campbell came to the network, so perhaps it would be in Crackle’s best interest to enter negotiations with the Chiodo brothers. The Chiodo brothers—Stephen, Charles, and Edward—were some of the premiere special effects artists of the ’80s, having created effects and puppets for Critters, the syndicated Monsters television series, and The Sword And The Sorcerer. In more recent years, Stephen Chiodo provided puppeteering work for Team America: World Police, the oft-forgotten That’s My Bush, and 2014’s Hangover/Hunger Games parody, The Hangover Games. The Killer Klowns “requel” is still in the development stage.